Extremely Average #55: Is It Worth It? The best part about blogging, as a beginner at woodworking, is that one learns much more than they would, were they doing the woodworking alone. Yesterday’s blog had some great reactions, and posed a great question, is it worth it? Is it worth the extra dollars for the expensive equipment? An experienced woodworker, who has tried a full gamut of tools, could give a solid argument for or against. I am not such a woodworker. With every purchase, the pros and cons must be weighed. There is an old adage; you get what you pay for. There is another one which goes, buy the best tool you can afford. Of course, old Ben Franklin used to say, and probably would still, were his voice not impeded by a nasty case of death, ‘A penny saved is a penny earned.’ Historically, I have been a terrible impulse shopper, not at all taking Ben’s advice. This has not been the case with woodworking however. (He said, knowing full and well, he ran amok with impulse purchases just yesterday, and wrote a considerable blog piece about that very fact.) It is the first time in my life where I have mulled over purchases for weeks or months, before making a decision. I spent a least a month deciding on the Bosch router. I took a week just to pick out a new set of drill bits. The decision to build or buy a router table started in November. It isn’t because of a new found restraint. It is more a case of fascination with all that is out there, and the research is definitely educational. I actually find the process enjoyable. Maybe it is that way with other things too, I wouldn’t know, as I haven’t ever tried it before. So this brings me back to the current items, which are trying their best to make it to the top of my list. I am considering the Festool RO Sander, a collection of nice chisels is something I would like, my first hand plane might be the Veritas block plane, a drill press or DJ1 drilling jig, a planer, SawStop table saw, and nice moisture meter. There are lots of other wonderful items, like a band saw, lather, and some nice spray equipment for finishing furniture, but they aren’t high enough on the list to mention. Oh wait, I just mentioned them. Oh well, I am on a roll. I went prepared to do my own, very unscientific test. I took in a piece of rough cut walnut, cut to 33”. I have lots and lots of this walnut, so this test will be more meaningful to me, than working on scrap pieces that Matt had with him. Because there wasn’t a lot of time, I decided to a comparison based upon how much progress I could make in 15 minutes. Of course, I lost track of time, and ended up going 16 minutes. This is how my test will go. I have spent 16 minutes sanding with the items that come in the 6” kit, on one side of the rough wood. I will now use my existing equipment, a belt sander and mouse sander, and see what I can accomplish in 16 minutes. I want to know how much difference there is between my current, albeit meager set up, and the Festool. It is not apples to bananas, by any means, and I am aware of that. 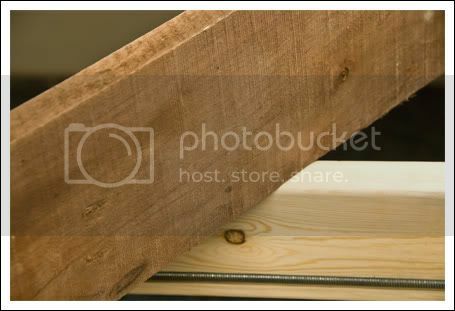 So today I have included a picture of the wood, in rough cut form, as a bit of a teaser for tomorrow’s blog. Now will this answer the question, “Is the extra money worth it, for the Festool, versus another company’s less expensive option?” No, as I said, it isn’t scientific. It will answer the question, how much improvement will I get for my dollars. I should mention that there was a customer with Matt the Festool guy, when I arrived. He had a finishing sander with him, which he had bought about a year ago. He didn’t feel like it did the job he wanted, not by a long shot. The customer builds furniture and cabinets and had used several other, very nice quality finishing sanders, before buying the Festool a year ago. He was very polite and explained that he honestly didn’t know if it was his sander, or operator error. Matt got out the piece of tiger wood that I had sanded on one side the day before. The customer looked at it and said he remembered seeing a piece of wood at the demo last year, and he truly didn’t believe that there wasn’t a finish on the wood. I told him that I had done the sanding yesterday. Matt turned the wood over and made a couple of passes with the customer’s sander, using the 220 grit paper that was on it. He sanded for only a very short while, and then stopped. All three of us felt the wood. It felt just like I expected, as I had done the same thing the day before. The customer thought it felt really good too. Around the table he walked, and grabbed a piece of scrap lumber and tried it himself. Sure enough, his sander worked just fine. But the customer still seemed confused. So they got the exact sander, which the customer had used, prior to buying the Festool. They fired it up and it was much noisier. After using both of them, side by side, the customer realized that his sander was working so much quicker, quieter, and the dust collection was so complete, that he was being fooled into thinking it wasn’t working. The last tip that Matt gave him, was to dial down the vacuum, which when on high, sometimes creates too much suction. The middle of the road suction worked better for his model of sander. In the end, he loved his tool, and left feeling much better about his purchase. So I am going to do my test, which will help me decide if I want to move it up the list. I may not learn anything that is helpful to anyone else, but what I will have done is recorded what I was thinking about and my reasoning for making the decision. This may one day, down the road, be incredibly valuable to me. I hope it will be interesting to all of you. and you won’t be frustrated over shoddy results . I really don’t care for cars that much, though if I had to buy something shinny, I would probably go with a Mini Cooper. I do like those. And visiting my LJ Buddys seems like a great idea. Brian, lets review what you have said. You want to compare your low end against the high end that you used. Thats not a comparison. The question is how does the high end sander compare against other high end sanders. Making use of this resource lets start by clicking on the ’ reviews’ tab at the top of this page. On the right hand side of the page is an index, scroll down to sanders. Their are 69 reviews plus many comments. By all means view as many as you like. It won’t take to long as there all types of sanders listed. But please look at the rigid at the top of page 5 and scroll to the festool at the bottom of page 5 and go on to page six the rigid again. I picked this as it also a six inch sander, and my personal favorite. I’ll let the reviews speak for themselves. Now a couple of questions Hook and loop 6 inch sanding discs are not commonly carried. HD, who sells rigid, stocks Norton disc’s in the common wood working grits and I order higher grits up to 1500 from Kingspor. Average is around a dollar a disc. One of the advantages of H&L is that you can change and save disc’s putting them on and off as many times as you want until the are used up. stick ons generally can only be attached once. Festool I believe, has to have a special disc. How much do the cost and how hard are they to find. My point is that if you want to compare this is a very good place to start. You have a Bosch router suggesting that this is a good quality product, doesn’t Bosch, a brand that you have experience with also deserve a look. And by the way if you proceed as planed your going to want a good sander to flatten the top of that router table.I’ve spent about 10 hours sanding my bench top in the last 2 days. Something that hasn’t been mention yet (or at least I haven’t seen it) regarding evaluating the relative value of a tool is what’s on the inside. One of the major ways a manufacturer can reduce their price point is to use more plastic parts for the gears and such and of course this has a direct bearing on the life of the machine. Unfortunately, this type of information is not easy to find since most reviews understandably focus on performance and not life cycle issues. However I have had some luck, in the past, contacting a rep for a tool that I am considering and asking for a run down on how the tool is made. I addressed your comment…”compare low end against the high end” I said it wasn’t scientific. It was NOT going to answer the question about comparing apples to apples. (Ok, I actually said, Apples to Bananas, because I do that when I am trying to be funny) I also said, that it wasn’t my intent to make the comparison you described. I want to know the depth and bredth of the difference. Given access to 5 or 6 sanders, I would do a scientific study. I am simply comparing two options at this time. If the difference between the low quality and the high quality isn’t much, then I would probably move sander way down on my priority list. That is all. I have a background in analytics with GEICO, so I agree with your point and it is very valid. To make a fair assesment and to then make a statement about Festool vs. (Company A, B & C), I would need to do a fair comparison. I am doing a comparison to answer a very specific question that I have about the time vs. quality of what I have now, compared to what many people believe is a high end option. If we assume that Festool is one of the high end options, then my results will lay down a baseline which will help me to analyze the cost versus the quality of all the choices between low end and high end. The disks for the Festool can be found at ACME, which is where I would buy the sander, if I choose that route. I will definitely read the reveiws you suggested. They may well be as good as Festool. I do like my Bosch router. Great response though, a lot of fantastic information. That is an excellent point about the parts. I am going to look into that as well. Brian, it sounds as if you have already made up your mind to get the Festool sander since you are going back for another demo. Go for it!!! I am sure Mary is needing some companionship. Just to comment on the earlier part of your blog, I think the reason we spend so much time agonizing over the decisions is because we are reminded of our choice every time we use the product. Every time I use my tablesaw, I kick myself because I made an error in my purchase. It is a good saw, but doesn’t really meet the needs I purchased it for. On the other hand, I have a few tools, like my inexpensive $10 8” irwin flush cutting pull saw and my very expensive (compared to my other tools) that make me happy every time I use them (except when the DC pops a breaker – separate topic though). I doubt I’ll be getting a festool tool anytime in the future, but if i could afford it, I wouldn’t be surprised if I ended up loving them. I’m looking forward to your comparison. I am pleased to see that I have another feline reader. Judging from the avatar pictures, there are a lot more cats who do woodworking, than dogs. Cats are cool. I agree with HokieMojo. A bad or good decision is re-lived over and over again. We have a relationship with our tools. They are our helpmate or nagging spouse, and in some cases that relationship has to last forever. When one pulls the trigger on the purchase, they usually stick with it until the tool dies. It is hard enough justifying the cost the first time around, and the second is that much more difficult. I will say this in defense of cheaper tools. They will teach you what you want or do not want in your tool relationship. They are like the girlfriends/boyfriends you date before you slip the ring on your finger. My cheap craftsman tablesaw taught me what I wanted in a heavier, more pricey model. When you first buy a tool, you really don’t know what you were planning on doing with it and you don’t learn that lesson, sometimes, until you find yourself wanting to do something but can’t because of the hardware limitations. In the interim, a cheap tool teaches you to cut, lathe, drill, route, etc. And that experience sometimes doesn’t come from the long penny count for the better machine. I bought my first tablesaw, router, and scrollsaw with the assumption that these would not be permanent purchases. I had a few hundred bucks and wanted to get in the hobby and learn what it is all about. The experience points gained was worth the initial investment. I also agree with David, go with what you enjoy using. Most of my tools are based on the feel of the tool (further enhanced by knowing too well what that cheap tool felt like). My new purchases are less agonizing. I do the research, find out if it does the things I really want it to (and I also think ahead to what I want to be able to do in the future). And, in the long run, it probably saved me some money and some heartache as I didn’t pull the trigger on an expensive tool I hate but can’t justify replacing until I get so tired of it that I end up replacing it anyway. Over all, though, you are the one getting married. And one thing I learned is that you don’t let your buddies tell you what to look for in that special gal/guy. Great insight, as always David, though your comparison to ‘getting married’ has frightened me a bit. If I had to convince a tool to ‘let’ me take it out, I would be stuck trying to fashion my projects using a sharp rock. It’s all about expectations. You can expect a lot out of an expensive tool, but you will almost always be disappointed in a cheap tool because it won’t perform as well nor last as long as you hoped.